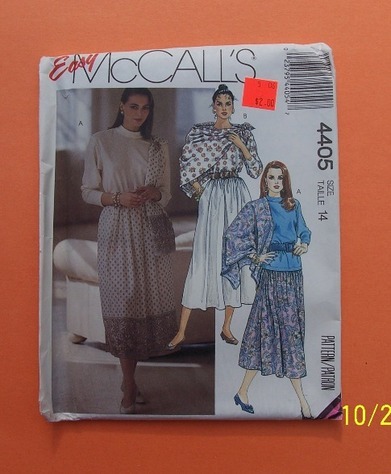 McCall's 4405. Misses' tops, skirt and scarves. Top A or B has extended shoulders, shoulder pads, long sleeves, back keyhole with hook and eye closure and with or without collar. Full gathered skirt has waistband, side seam pockets and side pocket opening. Pattern for oblong scarf and measurements for making square scarf are included with option of purchasing a square scarf panel. Condition: uncut/copyright 1989. Size: Misses' 14.